You are here: WPMU Hosting siti > Brussels2Family > abduction cases > MILAN FINAL TRAINING: A GREAT SUCCESS! 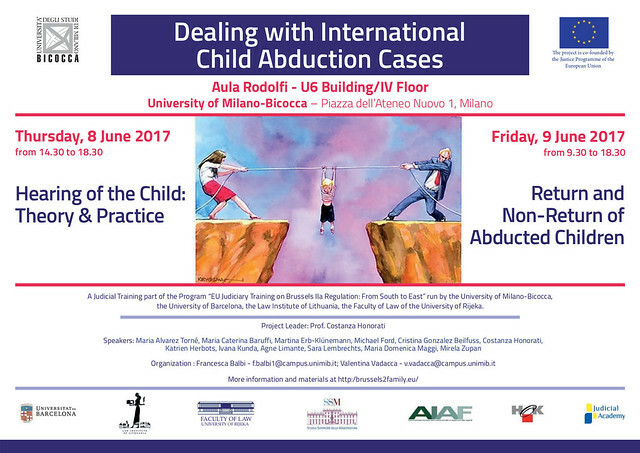 The final training session “Dealing with International Child Abduction Cases” organised as a part of the project “EU Judiciary Training on Brussels IIa Regulation: From South to East”, took place at the University of Milano-Bicocca on 8-9 June 2017. Project members from all partner institutions participated as trainers: Costanza Honorati, Maria Caterina Baruffi, Agne Limante, Kristina Praneviciene, Cristina Gonzales Beilfuss, Maria Álvarez Torné, Mirela Župan and Ivana Kunda. The training was divided into two days. On the second day, project trainers talked about “International Child Abduction” attracting the attention of the participants with questions and case studies to be solved. The event was a great success. 40 participants, including lawyers and judges, actively participated in the seminar. During both sessions there were lively discussions and comparisons on sensitive issues of the subject. Significant feedback from participants was received through evaluation questionnaires where participants had the opportunity to evaluate their trainers, the seminar in general, and organizational aspects. Many of them have written emails to thank us and congratulate for the great success of the event. In short, the result was more than satisfactory. We share below some photos taken during these two days of Judicial Training and … see you soon!